As soon as Mrinal ambled out of the arrival gate of the Dhaka airport pushing his luggage trolley which carried his singular suitcase, a young man ran up to him calling out. “No problem Kaka-babu, I will take care of everything…” Jayanta spontaneously switched to calling Mrinal as ‘Kaka-babu’, an endearing address for ‘uncle’ in Bengali. Mrinal smiled back as Jayanta took hold of Mrinal’s trolley and ushered him towards the waiting car. Mrinal spent that day in his hotel room taking rest and whiling away time to himself. The city was celebrating the Bakrid festival and Jayanta had advised him against going out on that day, as everything would be closed, and the city streets and localities would not be in a conducive state for strolling around. Mrinal understood and went by Jayanta’s advice. They both sat down in Mrinal’s room and discussed the itinerary and how they would proceed. After a couple of days in Dhaka initially, Mrinal wanted to proceed directly to Barisal city and then to visit his native village Punihat, if that was possible. Jayanta had heard about Punihat village but had not been there before. He belonged to the same Barisal district, but his village was towards Jhalokathi, some distance further south of Punihat. The next day, Mrinal and Jayanta started out after breakfast, in a car which Jayanta had arranged from his travel company for the day. Their first place of visit was the famous Dhakeshwari Temple which housed the idol of Goddess Dhakeshwari, an incarnation of Goddess Durga. Legend has it that the idol of the Goddess had been uncovered from a jungle in the same location by Ballal Sen, a popular king of the Sena dynasty of ancient Bengal, who had built the temple and installed the deity there. It is also said that the city of Dhaka derived its name from the Goddess Dhakeshwari and she is revered as the ‘Goddess of Dhaka’ by the Hindus residing there. The original idol of the deity had been shifted to Kolkata in 1947 during the Partition, along with hundreds of people migrating at that time. A temple was built at Kumartuli in Kolkata to house the deity and she is worshipped there even today. The idol in the Dhakeshwari temple at Dhaka is a replica of the original idol. Mrinal visited the temple and offered his prayers to the Goddess Dhakeshwari, as he began his quest in his true motherland. Mrinal’s hotel was in Gulshan, an upmarket residential area of Dhaka city, and it took him close to an hour in the morning traffic as he rode through the busy city districts of Elenbari, Tejgaon, Karwan Bazar and Hatirpool to reach the Dhakeshwari temple. Mrinal did not have much memory of Dhaka city from his childhood as he or his family seldom visited Dhaka. He was new to the city as much as the city was new to him. Jayanta next took Mrinal to the Sadarghat area, which was one of Dhaka’s busiest localities being the port area. The Dhaka city being located on the banks of Buriganga river, its port served as the most important transfer point for commuters coming into the city for work, business or leisure. Mrinal was awestruck seeing the large steamers and ferries anchored and jostling for space at the port-jetty at Sadarghat, and the sheer crowd of people getting off from these. Jayanta had told Mrinal that they would go to Barisal by water-way and from this Sadarghat terminal. The passenger steamers brought back childhood memories to Mrinal’s mind and he smiled wryly to himself. Quite near to the Sadarghat were the areas of Shankhari Bazar, Patuatuli and the famous residential mess house: Beauty Boarding. Mrinal had read about these areas a lot in his childhood that the Bengal revolutionaries who fought for independence against the British had made their hideouts in these areas. The residential mess Beauty Boarding was famous for being the hub and meeting place of many Bengali intellectuals, poets and authors. Being situated quite close to the extensive book printing and publishing locality of Banglabazar, this mess house had become a historical name by itself. Mrinal strolled around the lanes and alleys of these neighbourhoods which kept Jayanta wondering why the elderly gentleman would want to wander about in these lanes with so much interest. The rest of the day, Jayanta took Mrinal around in the car showing him the historical and present-day important locations of Dhaka. They visited the District Judges Court which was infamous in the time of the Indian Independence movement for the British judges passing execution orders for the Indian revolutionaries of the region. Mrinal visited the Bahadur Shah Park, which was originally called the Victoria Park after Queen Victoria in British India times, and still housed the monument to mark the spot where the young Bengali revolutionary Khudiram Bose had been executed. During their tour of the marketing district of Old Dhaka area, Jayanta suggested to Mrinal that they have lunch at the Star Hotel located in Dhanmondi. Jayanta apprised Mrinal that the Star Hotel was a popular and reputed chain in the city, and they offered a range of delectable Bengali cuisine apart from the biriyani fare. Mrinal was in the mood for the much spoken of hilsa fish from the Padma river, and as they took their seats at the table in the restaurant, he started scanning the menu for that. Apart from hilsa, there were other types of fish also available. Bangladesh being a riverine country, fish was available in abundance and in multiple variety. The hilsa fish itself was available in different forms of cooking, from the ‘shorshe Illish’ (hilsa in mustard curry), to ‘bhapa Illish’ (steamed hilsa), to ‘Illish’er jhaal’ (hilsa cooked with chillies) to the simple ‘Illish maach bhaja’ (hard fried hilsa), Mrinal was spoilt for choice. As he enjoyed a typical Bengali lunch spread with rice, vegetable curries and a hilsa fish curry, Mrinal could gather the exotic taste of the ingredients and spices used in the curries, especially the unique flavour of ‘charmagaj’ (watermelon seeds) the use of which as a spice was a specialty in the preparations typical of East Bengal. 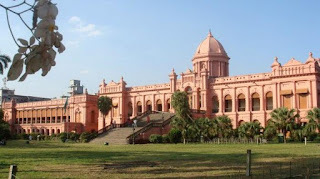 Over the next day, Mrinal explored few more localities of Dhaka, which included Bangshal, Mirpur, Ramna, Banani, Sher-e-Bangla Nagar, and the Dhaka University area. He also visited many iconic monuments and historic buildings like the Shahid Minar monument, Curzon Hall, Ahsan Manzil, Lalbagh Fort, the resting place of the revolutionary poet Kazi Nazrul Islam who was also the National Poet of Bangladesh. Mrinal was most touched by his visit to the Bangabandhu Memorial Museum which was Sheikh Mujibur Rahman’s residence where he and his family was brutally assassinated in a coup d’état by a military group, on 15th of August 1975. Jayanta took good care of Mrinal and always kept his comfort in mind as he carefully planned the itinerary for the city tour. He also constantly updated Mrinal about the places they were visiting and their immediate relevance or historical connections. Mrinal was quite indulgent with Jayanta and liked the way Jayanta called him ‘Kaka-babu’; they were getting along nicely together. A day later, in the morning, Mrinal and Jayanta were at the Sadarghat Launch terminal navigating the busy and moving crowd to locate the pier from which their Water-bus to Barisal would depart. The Greenways Water-bus service from Dhaka to Barisal was the quickest of all the water transport options available and Jayanta had booked their tickets on that for their trip to Barisal. What is usually a day long or an overnight journey distance, is traversed by the Water-bus in about six hours: leaving Dhaka’s Sadarghat launch terminal at 8 in the morning, the water-bus reaches Barisal port by 1 in the afternoon. This journey was a new experience for Mrinal and added to the excitement of sailing across the rivers of Bangladesh once again. The Water-bus had three decks or levels and was pyramidal in its structure. The lower deck, which was fully enclosed by large glass windows, housed the maximum seats and was air-conditioned for the comfort of the passengers. The upper two decks were for general passengers and had the cafeteria located in a corner. Mrinal took his seat near one of the windows and looked outside. The Dhaka Sadarghat terminal was teeming with people, which reminded him of the ever so crowded Howrah railway station in Kolkata. There were many passenger steamers and large three-deck boats parked along the quay and the white pyramidal large Water-bus stood amidst the crowd of boats and steamers as a glittering gem. Mrinal smiled to himself as he appreciated the advancement that Bangladesh had made in the use of its efficient network of river transport between various cities, towns and villages. It was evident that a large section of the commuting populace used the river transport network for their daily and frequent travels from one place to the other. Over the next six hours Mrinal not only did the journey from Dhaka to Barisal on the waterbus, but also traversed the journey of sixty-seven years in his mind and heart. The Water-bus left Dhaka Sadarghat terminal and first sailed into the Buriganga river. As it picked up speed and propelled itself ahead leaving the rolling waves in the river water behind, Mrinal looked at the Dhaka city shoreline and remembered his nightly journey which had taken him away from his home in Barisal years ago. Gradually, leading from one river into the other, the Water-bus crossed seven rivers one by one. 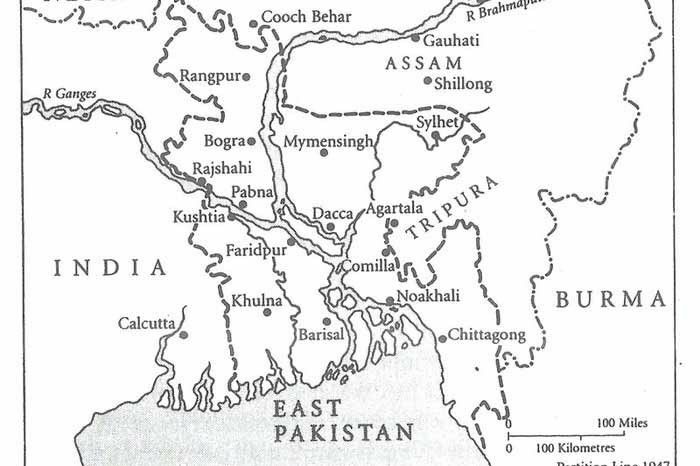 It soon left Buriganga and turned into the Shitalakhya river, then leading into Dhaleshwari and Yamuna rivers. As they turned a few bends and joined a very wide river, Mrinal knew that they had now entered the Padma river: one of the most famous rivers in Bangladesh. Soon came another turn and they found themselves sailing across the Meghna, another well known river better known for its turbulence and the might of its waves. 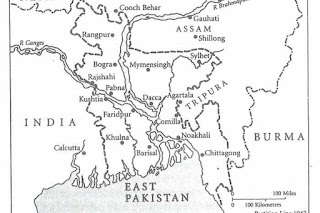 A lot of the folk songs of the country were based on the boatmen folk and they often sang about these rivers, especially the Padma and the Meghna. In the last hour of their journey, the Water-bus finally moved into the Kirtankhola river on which was the nearest to Barisal. As the huge Water-bus slowly docked at the Barisal Port, the passengers got into a commotion almost jostling among themselves in the hurry to get down. Amid the rush, Jayanta carefully escorted Mrinal and his small luggage and helped him safely walk down the gangway onto the shore. He made Mrinal stand at a side of the bank, away from the crowd which was still busy deboarding from the Water-bus and went in search of the car which was scheduled to receive them at the port. Mrinal looked around himself, at the landscape across the river and then on the port side. He tried to match what he saw with his memory from sixty-seven years ago, but the place seemed to have changed to a very large extent; he hardly could relate much. His mind however was going through a myriad of feelings at that moment: he was back to his native motherland…. he was once again standing on the soil of Barisal… a dream which he had given up on, but which suddenly came true after so many years. Mrinal bent down and touched the soil near his feet where he was standing and lifted his hand to his forehead: a gesture as if to touch the feet of his motherland in deep reverence and gratitude that he finally could set foot on this soil once again. Having completed his recce of Bakshibazar, Siraj and Zayed moved towards the Dhaka University area which was not far away. 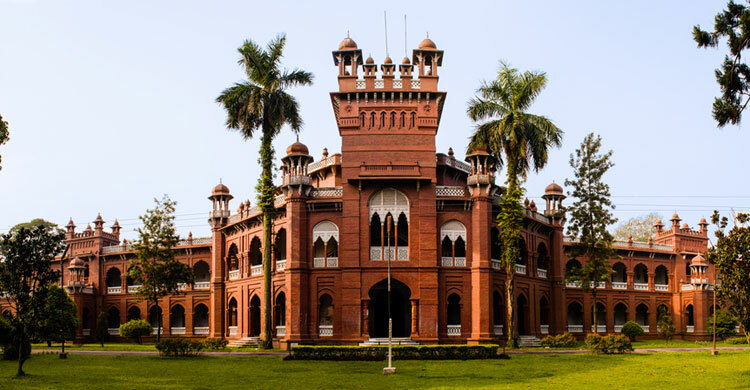 Zayed still had his contacts in Dhaka University and after a couple of phone calls which he made, they were allowed permission to enter the Departmental buildings of the University which are otherwise accessible only to the students, faculty and staff. Siraj was impressed with the expansive layout of the University and expressed his admiration to Zayed about the way the heritage of the place had been preserved. Zayed was only too pleased to hear good things about his alma mater and with renewed vigour started showing Siraj around the place. 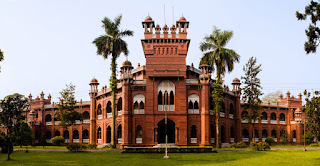 The department of history in Dhaka University was a common focal point for them and it was the place where Siraj headed to, as he shared the next bit of information with Zayed that his father used to teach here in 1971. Zayed was successful in arranging a brief impromptu meeting with Dr Zulfiqar, the Chairman and Head of the Department, who was delighted to receive Siraj. While the meeting was brief the conversation was heartening for Siraj and he left with the promise of an invitation to jointly work with Dr Zulfiqar’s department in Dhaka University on specific topics of Bangladesh’s history and related courses. During the conversation, Siraj mentioned to Dr Zulfiqar about his father being a professor in the same department fifty years ago. However, Siraj’s wish to see his father’s name etched in some record or list of professors remained unfulfilled as Dr Zulfiqar said that though there must be some list of the sorts in their archives, the same may not be readily available. However, if Siraj could requisition for it and check back with them, they may be able to initiate a search in their old records stack. Siraj nodded and smiled: the visit to the Department of History in Dhaka University was enough for him in remembrance of his father; he did not feel any immediate need to validate the information from an old record in the department. The Jagannath Hall and the roads and parks in the precincts of the Dhaka University seemed to bring alive in Siraj’s mind all the reports, essays and accounts he had read about the Liberation War of 1971. This was the scene of all the action and where-from things had sparked off and then spread like wildfire across the city of Dhaka. Albeit he was visiting the place in its modern look, but it was not difficult for him to imagine the past. Siraj walked the streets around the Dhaka university area with Zayed in tow discussing the history of the place. Zayed was already in awe of Siraj and the wealth of information he carried about the country, its past wars and the detail of events which he was relating to the locations they were visiting. Zayed suggested that they next move towards Old Dhaka area and stop by for lunch at the famous Haji Biriyani situated on Motijheel Road. Zayed animatedly started impressing on Siraj the name and fame of the restaurant and that it had been around for a very long time and served the most authentic Dhakai-cuisine. “Will we get the famous Dhakaiya Kacchi Biriyani there…?” Siraj smiled and asked. Zayed was caught with his jaws dropping and stopped in his tracks as he then broke into a smile. Siraj patted Zayed on his shoulder as they crossed the busy road negotiating the lunch hour traffic and quickly stepped onto the sidewalk. Soon the duo was seated in the air-conditioned dining hall of the restaurant with platefuls of Dhaka’s reputed Kacchi biriyani being served to them. Said to be prepared out of a fusion of Mughal biriyani with the local rice and meat preparations, the Kacchi biriyani was first prepared in Dhaka in honour of Mughal Emperor Aurangzeb when he had visited the kingdom. Prepared with highly seasoned rice and goat meat, with potatoes and a lot of locally available spices like saffron, clove, black pepper, cinnamon, cardamom and garnished richly with fried onions, garlic and raisins, the Kacchi biriyani stands out as a signature dish of Dhaka and a not to be missed gastronomic delight. The biriyani was accompanied by tall glasses of Borhani - a salted mint drink made of yogurt and eggs – greatly enhancing the gourmet meal experience. Having had his generous fill of biriyani, Siraj spent the next hour exploring Old Dhaka. It used to be called Jahangir Nagar, named after the Mughal Emperor Jahangir during whose reign Old Dhaka grew as a settlement area. The history of the place dated back to 1608 and it has passed through the hands of multiple rulers since but its character as a bustling and congested locality had hardly changed. As a market place, Old Dhaka seemed to Siraj to be a shopper’s paradise as it offered great variety and reasonable prices. The cluster of shops under a single roof were in fact extensive markets in themselves. Old Dhaka was once very famous due to its trade of muslin cloth and garments and still today a lot of visitors come here to buy muslin sarees and garments from the merchants. Dhakai muslin is proudly said to be one of the best qualities of cloth in the world, and a popular legend has it that an entire saree woven of muslin could pass through a finger-ring easily, such smooth and soft is the texture of muslin. Siraj also spotted a large and glittering upmarket garments and gifting store named ‘Aarong’ on Dhanmondi Road, which drew his attention immediately. Zayed explained that ‘Aarong’ in colloquial Bangla meant ‘village fair’ and that this retail chain was one of Bangladesh’s best in selling traditional Bangla handicrafts including the very special ‘dokra’ items, cotton, muslin and Dhakai-jamdani woven sarees and dresses and other gift items. To satisfy his interest, Siraj took a tour of their Dhanmondi Road showroom and was fascinated by the collection on offer. As he completed some selective purchase Siraj’s eyes fell on a range of exquisitely embroidered cotton cloth items which were neatly framed in decorative wall hang-ups of different sizes. As he enquired about those from the store representative, he learnt that these were ‘Nakshi-katha’ pieces. This was an information not so well known to Siraj and he listened on with interest as Zayed narrated to him the story of Nakshi-katha: Traditionally stitched for thin quilts, this was a centuries-old art form in Bengal, where the embroidery was done by hand on cotton cloth in the stitch-pattern popularly known as the ‘kantha-stitch’. It is often said that a true Nakshi-katha embroidery depicts a scene or a short folk-tale in its entirety on the quilt cover. In the recent times, this art form had been revived and given a commercial window where these excellent works of embroidery were being showcased extensively in Bangladesh as traditional Bangla art form. Siraj without hesitation procured a Nakshi-katha embroidery piece from the excellent collection which Aarong had displayed. As afternoon rolled into early evening, Zayed suggested that they visit Ramna and the adjoining area which were also on Siraj’s list of must-visit places in Dhaka. The Ramna Kali temple which was destroyed in the attack on it by the Pakistani army on 27th March 1971, bore witness to one of the most heinous mass killings in Dhaka during that time. Siraj was aware of the history of that attack as it had close links to the death of his parents in the same spate of killings which had spread to Bakshibazar soon after. As he and Zayed rode the short distance from Old Dhaka to Shahbagh, the location of the erstwhile Ramna Kali temple and its campus, Siraj’s mind was again clouded by the memories of the accounts of the ghastly period of 1971 which had got imbibed in him so deeply that it felt very personal at every thought of his parents. Siraj walked with a heavy heart around the precincts of the erstwhile temple. For him it was a sense of gratitude and tribute not only to his parents but also to the hundreds who had faced the similar fate in those horrific massacres across Dhaka city during that bloody period. Zayed pointed out to Siraj and showed him around the adjoining Suhrawardy Udyan – known as the erstwhile Ramna Race Course – which also housed the mausoleum of three leaders revered in Bangladesh: Sher-e-Bangla A K Fazlul Huq, Huseyn Shaheed Suhrawardy and Khawaja Nazimuddin. The Ramna Race Course ground held historic importance in the liberation war of Bangladesh. It was from here that Bangabandhu Sheikh Mujibur Rahman had delivered his historic speech on the 7th of March 1971, virtually giving the call for independence to his fellow countrymen. His words which had roused the nation: “Ebarer shongram amader mukti’r shongram… Ebarer shongram shadhinatar shongram…Joy Bangla!” [The struggle this time, is the struggle for our freedom… the struggle this time, is the struggle for our independence… Hail Bangla!] continue to echo in the hearts of the Bangladeshis. It was also in the Ramna Race Course ground that the Pakistani army finally and formally surrendered to the combined might of the Indian Army and the Bangladesh Mukti Bahini on the 16th of December 1971 that brought independence to the nation. Zayed all the while had been animatedly describing the history of Bangladesh’s independence war of 1971 and the details of Sheikh Mujib’s speeches and sequence of events which led to the liberation of his country in 1971, as he took Siraj around the Suhrawardy Udyan showing him the monuments there. Siraj, though aware of the history and the details, did not interrupt the young Zayed’s passionate talk and to an extent in his mind was appreciative of his patriotic fervour. He was beginning to get impressed with Zayed’s knowledge of history and detailed observations that he expressed during his conversations. For Siraj, Zayed reflected the youth of today’s Bangladesh and he was happy to see such awareness about his country’s past and present in Zayed. As they started to walk back to their car parked outside the garden complex, Siraj’s eyes fell on a mammoth gate like structure raising its head from behind the trees. “Zayed…. What is that structure? Siraj asked. “Do you know who had built that?” Siraj nodded and asked back. “So, you see… the past watches over the present”, Siraj said to Zayed, looking up at the Dhaka Gate once again as they left Ramna. Siraj smiled and patted Zayed on the shoulder, being impressed once again with his knowledge of local history. Zayed smiled broadly back to the middle-aged professor whom he had already grown to respect and like. “To the hotel now… we have had a long day,” Siraj said and Zayed dutifully conveyed the instructions to the driver as they reached their car in the parking lot. Siraj finished glancing through the Dhaka Tribune newspaper for the day, folded it and put it down on the side table. He was sitting in the lounge of his hotel, located in the upmarket Banani neighbourhood in Dhaka city. It was late morning and Siraj had already attempted a walk tour of the neighbourhood after completing his breakfast at the hotel. However, he had to abort his stroll as the streets and sidewalks were littered with blood and waste of the animals sacrificed for the festival, which being a hitherto unseen spectacle for Siraj had made him quite uncomfortable that he chose to return quickly to the confines of his hotel. Siraj was now waiting to meet a certain Zayed who offered to come over and explain various city tour options which could be customised for him. Siraj, though was not totally convinced with the telephone conversation, still agreed for the appointment as he felt from certain comments of Zayed that he at least knew the city well. But Siraj was in for a pleasant surprise as he heard Zayed speak, when they met at the hotel coffee shop some time later. As Zayed arrived and they greeted each other, Siraj suggested that they sit in the hotel coffee shop and speak. He noticed that Zayed was quite a young man, dressed in a pair of denim and a white knee length kurta, with a crimson decorated long scarf thrown around his neck. He sported a pony tail and a neatly trimmed French-beard. Overall, Siraj thought that he carried the air of an art or language student about himself, which sparked an interest in Siraj about him. “To be frank with you Siraj sir, I work for the travel company because I like to travel and show country to the visitors and tourists who come to Bangladesh. Many of them are not aware of the history and relevance of the places they visit here, so their journey remains incomplete…” Zayed told Siraj, ten minutes into their conversation. Siraj listened on with interest as a faint smile started playing on his lips. Siraj shifted in his seat and his body language probably sent a signal to Zayed that he was digressing, for Zayed quietened down his passionate overture of the importance of tourism in his country. Siraj allowed that indulgence as he was beginning to get impressed with the passion and the talk of this young man. “Zayed, I am looking for someone who will accompany me to the places I want to visit here…in Dhaka city and may be outside too…” Siraj leaned forward and came directly to the point now. Zayed’s eyebrows curled slightly as he expressed his curiosity. “Are you here to look for your roots? Or the places from where your ancestors hailed...?” Zayed questioned smilingly. “That’s what the majority of Indians come here for…” Zayed quickly said, as if answering his own question. “I can accompany you Siraj sir…” Zayed offered almost interrupting Siraj. He had sensed something about this middle-aged professor and his visit to Bangladesh from the conversation so far. Over the next few minutes of conversation Siraj outlined to Zayed the context of his visit, keeping the research angle as the main agenda while also visiting the places where his ancestors hailed from and the places where his father had worked and lived in Dhaka. Zayed listened patiently, occasionally nodding to express his interest. By the time their conversation ended, it was agreed that Zayed would accompany Siraj on his tour of Dhaka city and further to Barisal, Bakarganj and Faridpur. A tentative itinerary was also chalked out based on which Zayed would arrange the travel bookings, accommodation and other logistics. Their odyssey was to begin with Dhaka city the very next day when Zayed would come to the hotel in the morning to pick up Siraj. As Zayed turned to leave, after the customary parting greetings, Siraj suddenly called out after him. “Where have you done your education from, Zayed?” Siraj asked. “Sir… I have completed my master’s from Dhaka University” Zayed replied with a smile. “Which subject…?” Siraj asked curiously. “History…” came the reply. Zayed added on, “after that I had done a course in journalism and had worked for a newspaper for some time. But then I shifted to tourism and am now in this job with Shonar Bangla Tours and Travels”, Zayed gave his personal background quite proudly. Siraj nodded and smiled, “Very good….” He knew that he had found the person he wanted to accompany him in his quest. Before exiting the lounge of the hotel, Zayed turned back and saw Siraj walking across the lobby to the elevator. He seemed lost in his own thoughts and preoccupied. ‘There is certainly more to this man’s visit than mere historical research…’ Zayed’s journalist mind told him and he thanked himself for the opportunity which had landed on his plate to accompany Siraj. Siraj’s first place of personal pilgrimage in Dhaka city on the next day morning was Bakshibazar: the place where his parents lived and were killed, the place where he was born almost half-a-century ago. It was a good one hour drive from his hotel in Banani and Siraj took in the sights of Dhaka city as the car travelled through the neighbourhood of Gulshan, crossed Hatir Jheel, passed through Shahbagh and Shaheed Minar Road being flanked by Dhaka University, Jagannath Hall, Ramna and the Shaheed Minar monument on either sides, finally crossing Zahir Raihan Road and entering Bakshibazar. As the car passed the Bakshibazar Chowrasta Bus Station and approached the Jame Masjid, Siraj asked the driver to stop the vehicle. “We can get down here…ask him to park nearby somewhere… I want to explore the place on foot.” Siraj turned to Zayed and said. Zayed had been showing the places on the way to Siraj as they were crossing the landmark locations, much to Siraj’s help. Both got down from the car and Siraj looked around. The place was congested to say the least and the lanes and alleys were narrow. Siraj remembered the descriptions of Bakshibazar which his Aunt Rehana used to say to him in his childhood stories. She had also described the place to be very congested and having cramped houses. Siraj started walking aimlessly from one road to the other, turning into crowded lanes and leading into narrow alleys. Zayed had to step up his pace to follow Siraj and couple of times tried to call out and speak to him but Siraj seemed to be lost in his own world. Zayed felt that Siraj was looking for a house or place. “Siraj sir, if you know where to go, or have the address, we can ask someone or in the shops here…” Zayed tried to tell Siraj, raising his voice over the din of the streets. But Siraj just nodded his head sideways and curtly dismissed the idea. Zayed had no choice but to follow Siraj. The article in the Time Magazine of April 1971 - reporting the Pakistani soldiers setting majority of the sections of Bakshibazar on fire and then killing the people fleeing from their homes by firing bullets from machine guns – which Siraj had read in the National Library in Kolkata, flashed through his mind as he waded through the crowds of today’s busy Bakshibazar. Had his parents been killed on the streets while fleeing from their torched house, or had they been gunned down inside their house itself?’ Siraj’s mind shot such questions to which he had no answer. He did not even know which part of Bakshibazar his parents’ or uncle Moinul’s houses were. After five decades when he was finally there, where would he look or search. Siraj’s heart beat fast inside him with anguish. He was finally in Bakshibazar, the place where his parents lived and died; where he was born. Wandering aimlessly in the heat across the lanes and by-lanes of Bakshibazar for some time, Siraj’s mind started to calm down. He knew that this was realistically the closest he could get to his birthplace, to the place of his parents’ death, and he had to console himself to be satisfied with that. As he turned his steps towards the Bakshibazar Jame Masjid where their car was parked, he shared with Zayed that Bakshibazar was the place where he was born and that his parents had been killed here in the infamous Dhaka killings of 1971. Zayed was totally taken by surprise but chose not to ask Siraj any questions at that time. He felt that the professor would himself open up gradually to him with the actual intent of his visit. As Siraj and Zayed approached the Jame Masjid, they could hear the ‘azaan’ call “Allahuu Akbar….” wafting in from the loudspeakers attached to the minarets of the mosque. Siraj threw a questioning look at Zayed but his face belied him to be still lost in his own thoughts. For a minute Zayed was confused at Siraj’s reaction and didn’t know what to say. “Can we join the namaaz…?” Siraj quickly asked Zayed, even surprising himself. He had never considered himself to be a religious man though he had visited mosques very occasionally to offer prayers, but suddenly he felt that he must offer namaaz at the Bakshibazar Jame Masjid. He could not go back from here without thanking Allah from this place…. By the time Siraj and Zayed had entered the Bakshibazar Jame Masjid and completed their ablutions, the muezzin had sounded the iqama (the second call) announcing that the dhuhr namaz for the day was just about to begin. 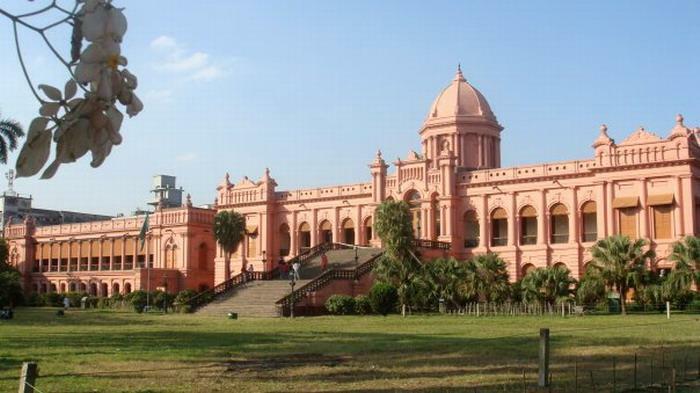 Photo: Curzon Hall, Dhaka University. Mrinal and his family reached Barisal city the next morning. They were exhausted, traumatized and scared from the events of the previous day and their miraculous escape from the clutches of the rioters in the village. Mrinal’s father, though he brought his entire family at one place now: in his Barisal city house, did not see much hope of returning to the village anytime soon. Further, he was concerned if staying in their Barisal city home would also be a safe option, as the wrath unleashed against the Hindus was wreaking havoc in the city every day. In his own mind he was thinking of sending his family over to India, to Asansol in West Bengal, where an elder cousin of his stayed. The respite for the family was short-lived in their Barisal city home, as the same vein of terror struck at their very hearts within a few weeks. As the communal violence and bloodshed continued on the streets of Barisal and similar news poured in from other parts of East Pakistan, they also received news of the fate of their native village Punihat, from an eye-witness of that night of carnage who later visited Mrinal’s father in the city. All the Hindu households in the village had been attacked and their houses torched and gutted. The people were mercilessly killed and those whose lives were spared had to embrace Islam forcibly. The news left the Sarkar family devastated as they realised that they now had nothing left in Punihat to return to: neither their home and lands nor their neighbours. Seeing the situation in Barisal city worsen by the day, Mrinal’s father had prudently started moving his family members in small groups, across the border to their shelter in Asansol under the care of his elder cousin. They already had procured the special passports which were required for travel between East Pakistan and India after the partition in 1947, so there was no further paperwork to be done. However, he had heard that the government was discontinuing the use of these temporary passports now and were collecting them at the border once someone moved into India. The safety of his children was the paramount agenda now, so he did not give much thought to these regulations for the time being. First to leave Barisal was Mrinal’s elder brothers and sister and while his father escorted them to Asansol and returned, Mrinal and his youngest sister stayed with their grandmother in their Barisal city house. Mrinal’s father had made acquaintance with the family staying at the head of the street and the middle-aged man who was the head of the household came across as a nice and helpful gentleman. They were a Muslim family from a nearby village and were staying in the city house for some years now, looking after their business in the city. After some hesitation Mrinal’s father had requested the man to assist and shelter his family in case some calamity befell them while he himself was away in escorting his children to Asansol. The Muslim gentleman had readily agreed and Mrinal’s father felt relieved. As if for his foreboding to come true, within a couple of days that Mrinal’s father left for Asansol with his two elder children, disaster struck again and this time in the locality where their house was situated. Mrinal and his sister huddled with their grandmother inside their house, sometimes hiding in the rooms or the kitchen as the violent mobs of rioters gurgled in rage and moved about in the lanes outside brandishing swords and fire torches. They rattled the doors of all the houses they suspected of being Hindu households and broke open into houses to search for Hindus. If they could lay their hands on any, they would kill instantly. As mob after mob passed their street and few even shouted and rattled on their door, Mrinal’s grandmother hid with the two children inside the kitchen. She was worried as the meagre rations were running out and there was absolutely no opportunity to step outside to fetch any. Their confinement in the house and at the hands of mortal fear continued for few days until one night when help arrived in the form of the kind Muslim gentleman from the house at the head of their street. Mrinal’s grandmother at first refused to open the door as she was unsure of the situation, but then she did and let the gentleman in. He explained to her that shifting to his house with the two young children would be the safest thing to do for her as it was only a matter of time before a group of rioters would break into their house. Finally, after some deliberation the old lady gave in to the idea considering the safety of her grandchildren and in the dark of the night, moved in to the house at the head of the street. Truly it must have been providence that had sent the gentleman to her house to bring her over that night, for a couple of days later their house was indeed broken in and raided by a violent mob, who having found no one and nothing of value had ransacked the house totally. 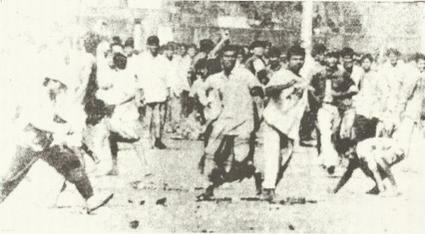 The rioters in the city had got whiff of the fact that many Muslim households were sheltering their Hindu neighbours or other Hindu families in their houses and soon had began to knock on the doors of Muslim families as well, conducting armed searches in attempt to find and drag out Hindus sheltered therein. The house on Barisal Sadar Street where Mrinal with his grandmother and sister were sheltered by the kind hearted Muslim gentleman was also not spared by the communal rioters. One evening soon after they had moved in, an armed mob banged the door of the house. Immediately, the gentleman’s family ensured that Mrinal and his grandmother and sister were hidden inside their store room well tucked away from the prying eyes of the lads who had rushed inside the house to search. Hidden behind large earthen jars in the store room, and his breath held short, a scared Mrinal could hear the enraged rioters warning the kind gentleman who had sheltered them of dire consequences if any Hindu was found in their house. To his amazement, their protector remained calm in the face of the violent ruffians and maintained that there was no one sheltered in his house, till the murderous search party finally left. Mrinal could never forget how this kind Muslim gentleman had risked everything to save their lives. The picture of the man forever remained etched in his mind. As Mrinal’s father returned to Barisal and learnt about the incidents which had taken place there in his absence, the immediate decision was to move the family to Asansol. Mrinal and all the others knew that this probably meant a final goodbye to the land where they had been born, had lived so far and had learnt to call their own. But the perilous circumstances did not allow them any luxury to wallow in feelings of grief. The route they chose for their final departure was by passenger steamer from Barisal to reach Khulna by overnight journey by the Kirtankhola and Kaliganga rivers, and then from Khulna to Sealdah Station in Kolkata by the Barisal Express train. It was a long and arduous journey which was fraught with life threats at every juncture. They had heard about the murderous incidents at the Ilsaghat steamer station some weeks before and it had unnerved them considerably, but they knew that they could not defer their journey anymore. Very soon one evening, Mrinal and his family boarded the passenger steamer and left Barisal for Khulna. As the steamer sailed away from the port and the twinkling lights of Barisal city slowly faded into the darkness, Mrinal stood on the deck looking at them, oblivious of the tears rolling down his cheeks. He now fully realised that not only his village Punihat but also Barisal city where he loved to come frequently was going to be lost to him forever. Before he turned away from the deck railing, unknown to his father who stood beside him, Mrinal made a wish and a silent prayer that someday he will return to his homeland. As he lay down on the deck and looked at the night sky that night, his heart wrenched within him and his chest convulsed as he tried to suppress his silent sobs: he knew, his home and his land was slipping away like sand between his fingers and all he could do was writhe in anguish. Grief gave way to anger in his heart as he mulled over the events of the past few weeks that had led to his carefree life being curtailed and being uprooted harshly. Tossing in such myriad of emotions and thoughts Mrinal fell asleep on the deck as the cool breeze of the rivers soothed his troubled heart. Sixty-seven years later, as Mrinal once again set his eyes on the land mass of his native homeland from high above in the sky as his aeroplane flew into Dhaka city, he was lost in the thoughts of the time and circumstances in which he had left this country. A lot of water had flown under the bridge since. The young boy Mrinal of 1950 was in his seventies now and returning to his homeland seemed like a fantasy dream come true for him. Like he had changed so much in life, so had the country he had left behind in his childhood. It was East Pakistan then and was a proud and liberated Bangladesh today. Mrinal had been following every development in his land across the border over all these years and had kept himself abreast of the political and social changes that the country had undergone and evolved through. Initially he had always been hopeful and optimistic of returning to this country, but as he grew in his own life and settled down in Kolkata, he gradually realised that it was a mirage that he was chasing. Having battled a roller coaster of grief, anger and disappointment in his heart on this issue, he had reconciled to the feeling of frustration and then finally given up on it: it became a closed chapter in his life. It had therefore surprised him when some months ago he had applied for his passport on the insistence of his younger daughter, he once again felt the long-lost wish of visiting Bangladesh and seeing his native village. Unrequited dreams do not die… he had told himself, as he saw the possibility of a visit. Mrinal’s flight from Kolkata landed at the Hazrat Shahjalal International Airport in Dhaka on the morning of the 2nd of September with a mere handful of passengers. As he ambled out of the plane and followed the signages directing him onward, he took in the expansive look and layout of the airport. Upon reaching the immigration lounge, he was handed an arrival form which was to be completed for the immigration and customs check. Mrinal fumbled in his bag for a minute but could not locate a pen. ‘Usually it should be there in the bag…. Maybe I have forgotten to keep it’, Mrinal thought to himself as he looked around and spotted a gentleman ahead of him at the forms desk. He recognized him to be a co-passenger on the same flight from Kolkata that he was on. Mrinal stepped ahead and thought he will request the gentleman for a pen. Having obtained a pen from the gentleman, Mrinal carefully completed the arrival form ensuring that all details were filled in correctly. Once he was done, he looked around for the gentleman to return his pen, but the person was nowhere to be seen. ‘Maybe he has forgotten and gone ahead’ Mrinal thought as he walked towards the Immigration Officer’s counter. ‘If I get to see him at the baggage reclaim area, I shall return the pen to him at that time’. The immigration officer looked with interest at Mrinal and checked his new passport and the visa stamped on it. After the customary set of questions, the immigration officer affixed the entry stamp on Mrinal’s passport with a thud. “Welcome to Bangladesh, Mr Sarkar… hope you have a nice stay.” He said in a matter-of-fact manner as he handed the passport back to Mrinal, who smilingly nodded. Mrinal had coordinated his trip with a Kolkata based travel agency which also had offices in Dhaka and elsewhere in Bangladesh. They were scheduled to pick up Mrinal from the Dhaka airport and manage the rest of his trip locally. Mrinal looked at the entry stamp on his passport and smiled to himself. ‘Sixty-seven long years…. but I finally came!’ He felt a lump in his throat as a surge of emotion swept over him. Even though sixty-seven long years had elapsed since, the memories of his carefree childhood days and growing up with his brothers and sisters in the lush green and expansive village of Punihat, had hardly faded from Mrinal’s mind. When he was not reciting stories of his days in Punihat and Barisal to his children and then later to his grandchildren, Mrinal often reminisced about those days which were gone forever and his favourite village to which he could never return. Sometimes such thoughts made him pensive but remembering occasional moments of mirth and laughter from his childhood also gave him a sense of joy. He felt he had enough memories of his land left behind, to sustain him as he lived his life in Kolkata. However, it was not only happy memories, or the anguish of the time and place left behind that Mrinal thought about. He could also never forget the agony and trauma of that week in February 1950 which suddenly had burnt his joyous childhood life in the flames of communal hatred and violence. However, he seldom spoke of those days as it pained him greatly and made him restless in his mind. Some scars never heal and Mrinal felt that this was one such; it was unfortunate that he had had to go through this at such a young age that it had made an indelible impact on him. Mrinal loved the locales of his village Punihat, where he was born. Surrounded by tall coconut trees and occasional clusters of fruit bearing mangroves, the village was sheltered and tucked away from the highways and rail tracks which connected the major nearby towns. It had expansive agriculture fields where the men grew their rice and vegetation; few large ponds which catered to the water and irrigation requirements of the households and fields, and a tributary of the river Kirtankhola which flowed nearby. It had a few households who lived in pucca-houses and it was mostly these folks who owned most of the agricultural land in the village. The largest house which Mrinal remembers in his village was called the ‘Hazra-bari’ – the house of the Hazra family, who also owned a couple of large ponds one among which was the source and supply of drinking water for the entire village. ‘Hazra-bari’ was literally a baronial mansion with sprawling quarters and courtyards in its precincts. They were the wealthiest family in the village and though not the titular ‘zamindar’ but were revered by all as one such. The other households of note were the ‘Ray-bari’ (house of the Ray family), the ‘Ghosh-bari’ (house of the Ghosh family), the ‘Sen-bari’ (house of the Sen family) and the ‘Sarkar-bari’ (house of the Sarkar family). It was the ‘Sarkar-bari’ which was Mrinal’s home in Punihat village. They owned several acres of land which was given away for agriculture and cultivation to local field workers and the family traditionally thrived on the income derived from the lands, though Mrinal also remembers his father used to work in the nearest city which was Barisal. Mrinal knew that they had relatives staying outside Punihat: his grandmother used to stay at Khulna which was about a day and a night’s journey from Punihat village, and an elder uncle in far-away Asansol which was further beyond the big city of Kolkata. They used to travel occasionally to these places and as a child such journeys were of great excitement to Mrinal. Whether it was because of Mrinal’s father being in Barisal or that all their journeys used to be enroute Barisal city, Mrinal’s family had a city home in Barisal too. Mrinal and his siblings used to alternate between their village home in Punihat and the city house in Barisal, though Mrinal recollects that he loved staying in his village home most of the time. The small village of Punihat lay between the larger villages of Nalchiti and Jhalokati and Mrinal remembers that once a week they would visit either of these villages to purchase household items from the weekly village markets which would congregate there. Nalchiti was the nearest and the market was called the ‘Manpasha bazar’ to which they would often go by canoes through the river streams flowing by the villages. The region was mostly dominated by Hindu households and general peaceful co-habitation of people and the feeling of brotherhood existed. That was till the week of the 16th of February 1950. Mrinal still shudders to think of that fateful evening when his father suddenly came home unannounced and quickly asked everyone to switch off the lights and close the windows of the house. Mrinal, his middle brother who was just above him and his younger sister were at their village home with their grandmother, while his eldest brother and sister were at their Barisal city house with their father. They were all very surprised to see their father arrive in Punihat but soon realised that some danger was brewing which had brought him to Punihat out of turn. Mrinal’s father soon shared with them that communal riots had broken out afresh in Barisal district and he had received news that the Hindu-majority villages in the Nalchiti and Jhalokati areas would be targeted over the next couple of days and nights in the attempt to kill, loot and drive out the Hindu families from their homes. That night the Sarkar family spent in the darkness of their home, all huddled together and lying in fear of an impending attack. From time to time they could hear cries and roar of mobs piercing the calm of the night in the distance, which signalled to them that the rioters were lashing on to households in nearby villages. No one dared to peer out of the windows, but had they done so, they could have seen the flames of burning houses in the villages quarter of a mile or so away from Punihat. The night passed in silence and gripping fear and as dawn broke Mrinal’s father stepped outside in the courtyard to do a quick visual survey of the situation. Everything seemed to be in its place and there was no sign in and around the immediate surroundings of Punihat which showed that the rioters had come in that direction. But in the late morning hours, someone knocked on the bolted entrance door of the Sarkar house. The children shivered in fear as they looked at their father and grandmother. Mrinal’s father opened the door slightly and peered outside. He saw Hasan Molla the head of the agricultural field labourers’ group of the village and a few other Muslim men standing outside his door. Mrinal’s grandmother shrieked at the sight of these men through the ajar door as she feared the worst. “Babu, we want to speak to you… can you come with us to Hazra-bari now?” Hasan Molla spoke in a low voice to Mrinal’s father. Mrinal’s father looked at Hasan Molla and then scanned the faces of the people standing around him. He felt he knew most of them: as workers in the village agriculture fields, but he wasn’t sure. “Everyone is gathering in the courtyard of Hazra-bari…” Hasan Molla continued, “We have news that there may be an attack on our village tonight… so, all the people have gathered there to discuss how to protect the village…. and the Hindu houses here” Hasan Molla added the last phrase slowly, as if in an afterthought. Mrinal’s father nodded his head as he took time to think over the matter. It was a question of trust that was going on in his mind. Finally, with a gesture of his hand, he asked Hasan Molla to wait and stepped inside closing the door after him. Much to the relief of the family, Mrinal’s father returned within a couple of hours: safe and unhurt. However, the news which he carried back with him was devastating. Violent mobs of rioters from Jhalokati and Nalchiti were gradually advancing and were on a mission to ‘cleanse the villages of all Hindus’ and they would stop at nothing. They were calling upon the Muslims residing in these villages to join their band in killing and driving out the Hindus from the villages. Anyone who objected were either slain on the spot or forcibly converted to Islam by being made to recite the Islamic kalmas then and there. At the meeting at Hazra-bari, the debate was primarily if the Hindu families should leave the village before the rioters arrived that night, or should they stay and put up a fight. The Muslim households who had joined the meeting were empathetic to the situation of the Hindus but also made it clear that in the face of the violence that the rioters were perpetrating they may not be able to provide much shelter or support to their Hindu neighbours. “So, what should we do…?” Mrinal’s grandmother asked in earnest looking at his father. “I don’t know….” Sighed Mrinal’s father. “On one hand, I am thinking of the safety of all of you… and for that we must leave the village and go and stay in our Barisal city home… On the other, if we leave the house and the lands here at the mercy of the rioters, nothing will remain here… they will destroy everything…” Mrinal, even at such a young age could sense the deep anguish in his father’s voice. Mrinal’s father knew that leaving the village was the only choice now... but he wasn’t sure how to get out of there. Hasan came to his rescue once he voiced his concern. In the next hour, Mrinal’s family had packed their belongings or whatever they could take along with them and boarded the tarpaulin covered rickshaw-van which Hasan Molla used to transport his crop weekly to the market. From among the cluster of trees and mangroves and other vegetation that adorned the village of Punihat they could see flames leaping up into the darkness and Mrinal could understand from the direction of the flames which Hindu house was being torched. The war cries of the bloodthirsty rioters seemed to now come from near and as the metallic din and sound of occasional gunshots smothered the once peaceful atmosphere of his beloved village, their rickshaw-van took them safely away with Hasan Molla furiously pedalling the rickety vehicle to accelerate as much as he could on the unmetalled village road. Mrinal held his younger sister tightly against his chest as his heart throbbed to match her muffled sobs, while he peered from within the folds of the tarpaulin cover that hid them. All he could see and hear were the village houses gradually going up in flames and a distant coalesce of metallic clashes, gun shots and human voices wailing and screaming, until a sudden flash of fire burst in a particular direction told his transfixed eyes that the mob had set fire to his own home which they had deserted only a while ago. The river bank of Kirtankhola nearest to the Punihat village was also a makeshift boat jetty and as soon as they reached, they found some more Hindus assembled there. Hasan Molla was fully drenched in sweat by then; his temples throbbed, and chest heaved as he spoke in between his gasps. “My friend Abdul has a boat tied here and he will take you to Barisal city by the river…. Please trust him and go safely…” Hasan breathed heavily as he told Mrinal’s father and waved at his friend Abdul. Mrinal’s father knew Abdul from earlier times as he and his family had availed his services in the past to go to Barisal in his boat. Though this was no time for pleasantries, Abdul greeted the young children who knew him as Abdul majhi, or Abdul – the boatman. Before Mrinal’s father could say anything, Hasan turned and ran into the darkness towards his rickshaw-van which he had left at a distance, away from the river bank.